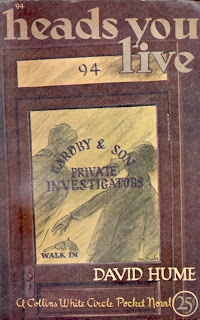 In addition to the four paperbacks discussed in part I Federal Publishing published two 64 page magazine size books. 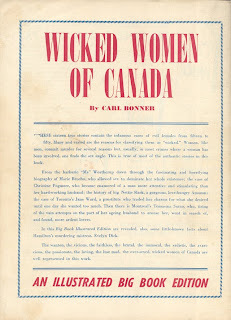 Illustrated Big Book 1, Wicked Women of Canada by Carl Bonner, has a 1950 copyright date. 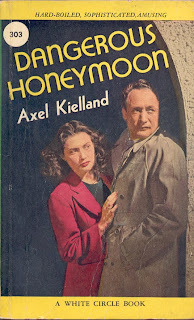 Carl Bonner is a pseudonym for Thomas P. Kelley, the "king" of Canadian pulp. 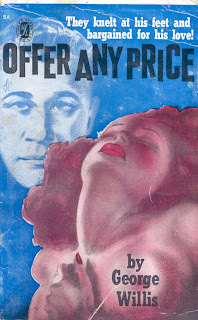 The inside back cover advertises the second Illustrated Big Book - The Price a Man Will Pay by Beth Brown. Continuing with my series (part I and part II) on Wm. Collins Sons & Co. Canada Ltd.'s White Circle artist Margaret Paull here are covers 13 through 20 of her 67 signed covers. All are 1944. In the first four parts of this series on Wm. Collins Sons & Co. Canada Ltd.'s White Circle authors I've mentioned there were 153. This is not strictly correct. There were 153 author names but thanks to pseudonyms the number of authors drops to 142. 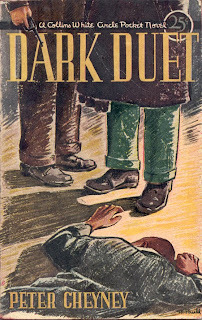 In this post we'll look at two authors who used pseudonyms. Artists where known are in brackets. 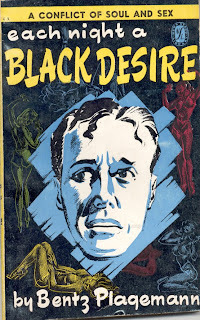 Edwy Searles Brooks had 24 books published by White Circle - 17 as Berkeley Gray and seven as Victor Gunn. 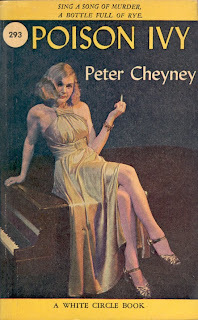 Only Peter Cheyney (24) and Charles Horace Snow (31) had as many or more (see part I of this series). 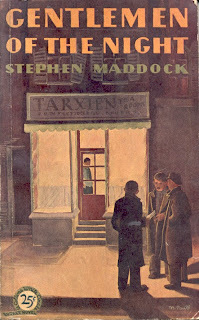 Here are four of his books published over a number of years that show the change in cover styles. 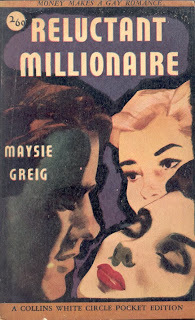 Maysie Greig had 12 books published by Collins - seven published under her real name and five as Jennifer Ames. Here are three of her books. 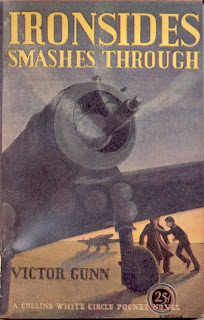 In part I of this series of posts I discussed Export Publishing Enterprises Ltd.'s approach to abridging their books. 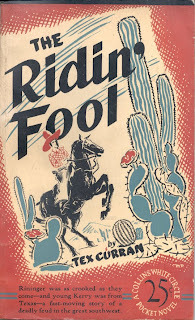 Here is an example from another publisher of the era - Alval Publishers of Canada Ltd. of Toronto and their Crow imprint. 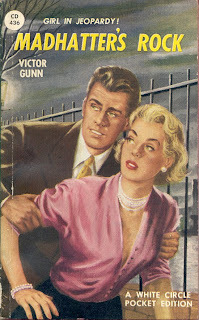 Twenty-four (numbers 21-44) books were published in this series. 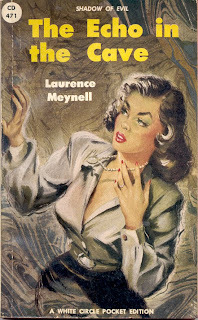 Many of the books had recently been published as paperback digests by Astro Distributing Corporation of New York. 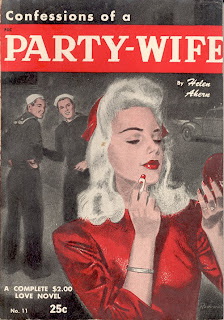 For example Crow 28, Party Wife, had been published by Astro as Confessions of a Party Wife, number 11. 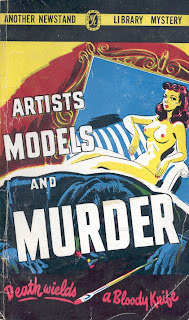 The Astro book was published in 1948 and the Alval book in July 1949. 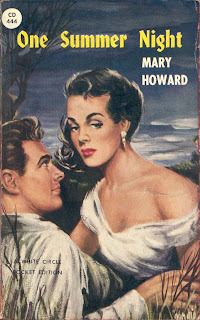 The book was originally published as Love Must Be Gay (New York: The Macaulay Company, 1935). The Astro edition states that "this book has not been abridged or condensed in any way." 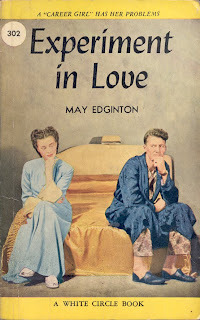 The Alval edition makes no such claim for a good reason - approximately 45% of the book has been cut. The Astro edition has 24 chapters. The Alval edition eliminates chapters 21 and 22 and cuts most chapters in the last half of the book anywhere from 50% to 75%. The first half is relatively untouched. One gets the sense that the editor of the Alval edition realized half way through the text that he needed to get busy to fit it into 160 pages and started cutting everywhere. It is hard to imagine the book making much sense in the last 80 pages. 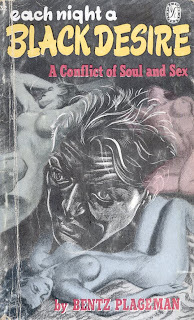 One last interesting comparison is the cover. 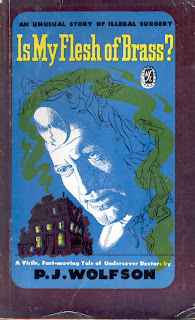 The Alval edition is a direct copy of the Astro edition (artist - Rodewald) by a less talented artist. Note the minimalist approach to the car. 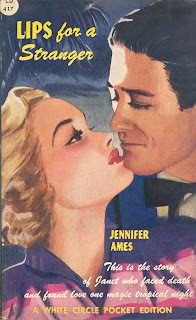 Also the young Mrs. in the Crow edition appears to have her eyes completely closed. 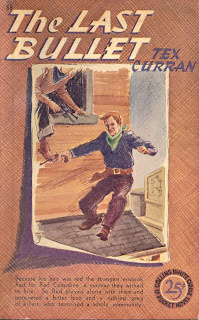 Many of the covers on Crow books are done in the same way. The Beginning of Export Publishing Enterprises Ltd. In an earlier post I talked about the end of Export in December 1950. Here is a brief introduction to the beginning of Export. Three Toronto businessmen, Stanley Schrag, Frank Steele and Martin Kastner started Export in 1946. For a couple of months they tried to find a name that was acceptable to the Federal Department of Secretary of State. Names like Canada Periodicals Limited and Associated Magazine Publishers Limited were either already in use or close to names in use. 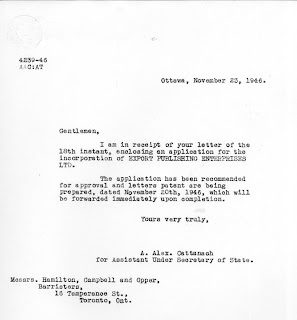 Finally Export Publishing Enterprises Ltd. was accepted with November 20, 1946 as the date of incorporation. 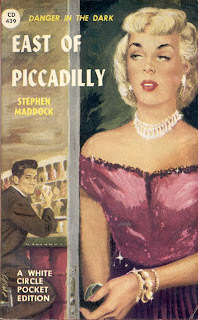 The first books published by Export were two "Thrilling Novels" for the post war UK market. As far as I know these are the only books. Below is a bibliographic description of both books with the title page, collation, contents, binding and notes. 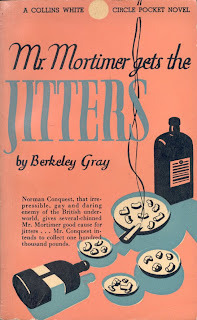 Note the books are printed in 1946. 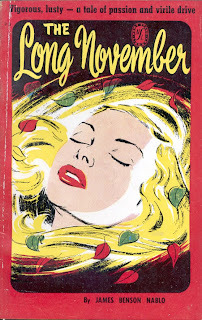 Given that Export didn't know that its name was approved until November , 1946 this printing date is puzzling. Collation: pp. [1-4] 5-127 ; 175 x 120 mm. Contents: p.  title;  A THRILLING NOVEL | Published by EXPORT PUBLISHING ENTERPRISES LIMITED | TORONTO, Canada | Exclusively for | T. A. & E. PEMBERTON LIMITED, | 11 BLOSSOM STREET, | Manchester, England. | All characters and situations in this book are fictional, | and any resemblance to actual persons or occurrences is a | coincidence. 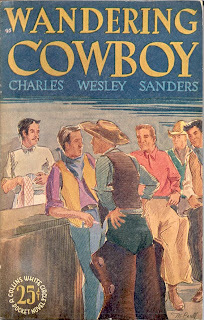 | PRINTED IN CANADA, 1946;  CIMARRON | BEND;  advertisement; 5-127 text;  advertisement. Binding: Four stapled signatures of 16 leaves each. Inside covers have advertisements. 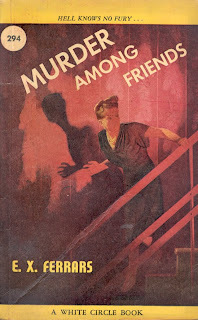 Note: First Published New York: The Macaulay Company, 1936. Collation: pp. [1-4] 5-126  ; 175 x 117 mm. Contents: p.  title;  A THRILLING NOVEL | Published by | EXPORT PUBLISHING ENTERPRISES LIMITED | TORONTO, Canada | Exclusively for | T. A. 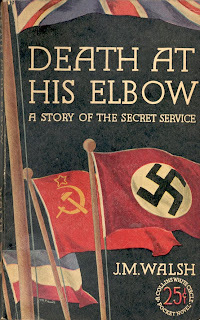 & E. PEMBERTON LIMITED, | 11 BLOSSOM STREET, | Manchester, England | All characters and situations in this book are fictional, | and any resemblance to actual persons or occurrences is a | coincidence. 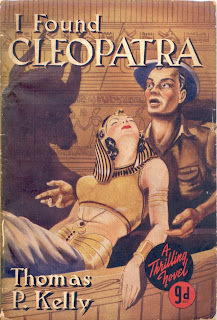 | PRINTED IN CANADA, 1946;  I Found | Cleopatra;  advertisement; 5-126 text;  advertisement;  blank. 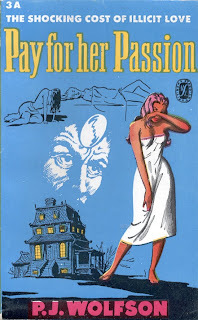 Note: Originally published in the American pulp Weird Tales as a four part serial from November 1938 to February 1939. 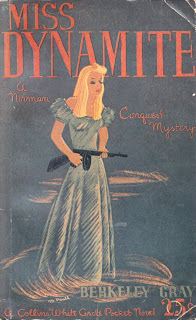 It was reprinted as a three part serial in the Canadian pulp Uncanny Tales from July to September 1941. The Export edition is abridged. Continuing with the covers done by John Fernie for Wm. Collins Sons & Co. Canada Ltd.'s White Circle imprint. All are 1950. 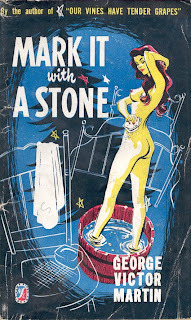 In early 1947 William Collins Sons & Co. Canada Ltd. started using photo covers for their White Circle imprint. This was unique in Canada at the time. A trade magazine article (Quill & Quire, April 1947) provides some background. 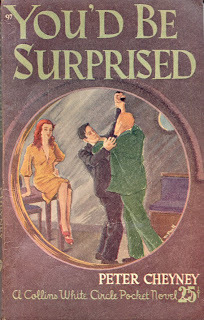 The article opens with “perhaps working on the theory that truth is more interesting than fiction, if not quite as strange, the White Circles … have recently gone in for photographic covers.” The photographer, at least for the early covers, was Earl Morris of Pringle and Booth Studios of Toronto which were “leading Canadian photographers [with] a pretty glamorous set-up.” When “the models arrive, which quite frequently is a little late, one of the privileges of beauty, they are told what sort of character they are to portray, and various poses and expressions are shot. If costumes are necessary, or outside props, a rough sketch is drawn by Miss Margaret Paull, White Circle Art Director, and the models and studio assistants try to fill the requirements as accurately as possible.” Both colour and B&W photographs were taken. Five photographs accompany the article, one showing a studio set up for Dangerous Honeymoon (303) , three of models in various poses (with the caption “Cheesecake plus!”) and one of the President of Collins, Franklin F. Appleton, smiling with three of the models. 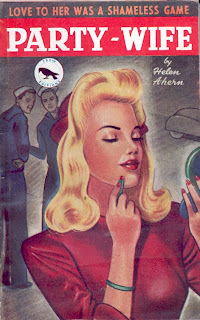 The article notes “the girls were carefully chosen from Canada’s collection of beautiful models so that with the wide and ever growing circulation of these books, Canada’s particular type of beauty will be known all over the world.” Three models are named, Rose Burkett, a former Miss Toronto , for Duchess Hotspur (313), Marnie Williams for Poison Ivy (293) and Dorothy Henderson for Dark Hero (316). All but four of the photos were colour, although some of them appear to be B&W with colour added. A few covers were combined photo and illustration. About three-quarters of the covers were female only with the rest having one or two males joining the female. A cigarette was the favourite prop, with liquor second. The women usually wore evening dress but ski wear, swimming suits and nightgowns were also seen. 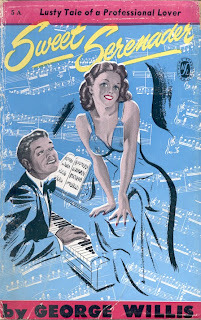 Two covers had notices for the supplier of the evening dress, Golden Gate Dress Co. for The Urgent Hangman (336) and Ricky Formals for Dance Without Music (391). Here are the first five photo covers of the 32 published. All are 1947. 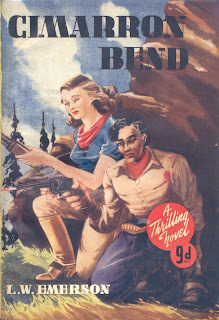 In part I I introduced Margaret Paull who started working in 1943 for W. Collins Sons & Co. Canada Ltd. as an artist for the White Circle imprint and posted her first six covers. 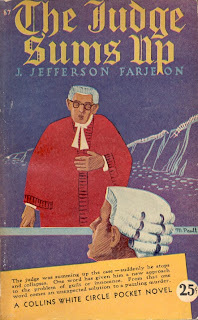 By mid 1944 she was “in charge of design and format on Collins’ productions and advertising” (Quill & Quire September 1944, p. 70), including hard cover dust jackets. 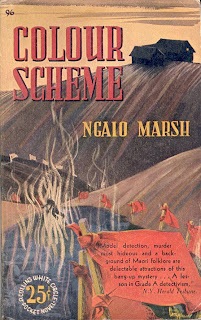 A 1947 article on Canadian book design said that “Collins is also one of the few Canadian publishers employing a full time staff artist in Margot Paul [sic] who is responsible for many a clever jacket, advertisement or catalogue in an amazing variety of styles” (Q&Q January 1947, p. 33). 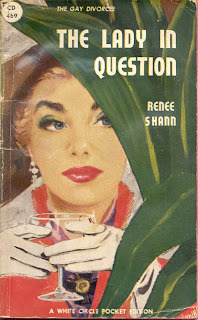 A 1948 article (Q&Q November 1948, p. 15) included her among artists whose “recent publications bear witness to the growing maturity and originality of Canadian jacket art” and in 1949 Paull was one of three dust jacket designers to have a book in the First Annual Exhibition of Canadian Advertising and Editorial Art (Q&Q May 1949, p. 17). Here are the next six of her 67 covers for White Circle. The first one is 1943, the rest 1944. 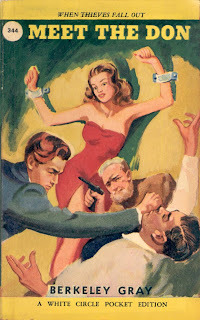 Toronto's Export Publishing Enterprises used bare naked ladies (BNLs) on its covers to a degree unmatched by other paperback publishers of the era - Canadian or American. 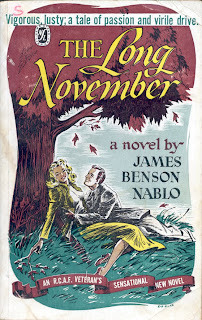 They hit the ground running with three of their first four books published in mid 1948 displaying BNLs. 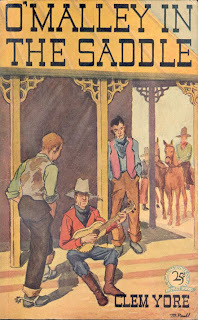 The next two were 16 published in December 1948 and 32 in March 1949. Unless noted artwork is uncredited. 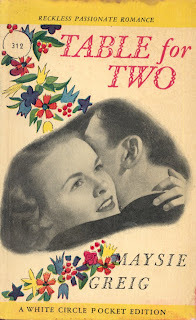 In part I I discussed Export Publishing Enterprises's US 28 book series and highlighted three of the 20 that were published with and without dust jackets. Here I'll continue with the first five books (numbers 1A to 5A) in the series. 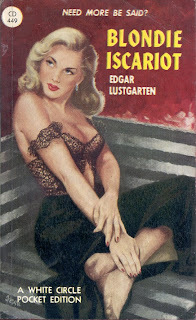 Twenty-five of the 28 were new editions of books first published by Export in their first series. 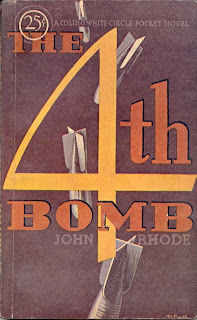 The first five were reprints of American books while the remaining 20 were either new editions of Export paperback originals or, in one case, a reprint of a Canadian publisher's book. So this means that Export had exported five American copyrighted books into the US. 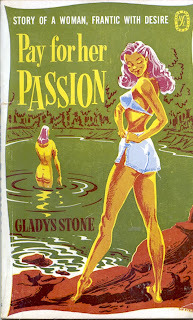 It's obvious from looking at the books that this was in contravention of Export's contracts with the American publishers for reprint rights in Canada. For each of the books Export crudely disguised the copyright that had been printed on the Canadian series editions. In the first four books the copyright was blacked out although it can just barely be read. In the fifth book the copyright notice was deleted. Here are the five books with information for the US edition and then the original Canadian edition. 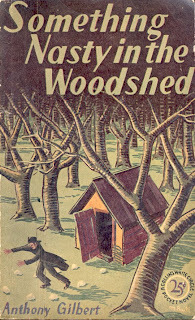 If different the first edition cover is also shown.